Having written about the wisdom of developing a philatelic collection plan, I decided to write one out for my own personal collecting interests. Things went fairly easily - I was, after all, following my own advice - until I reached the section that read, "Decide how you are going to house your stamps." The problem is that I don't normally need to house stamps. Although I have a lot of stamps - boxes full, albums and stockbooks with stamps in them, and so on - my interest at the moment lies in collecting philatelic covers, or entires, i.e., a complete envelope with stamp attached. And covers are nowhere near as easy to store as are stamps. Stamps, generally speaking, fit into stamp albums, and the ones that don't fit into stamp albums for one reason or another usually fit quite well into stockbooks. There's occasionally a bit of an issue when one has a large multiple, like a block of twenty, but this issue is easily resolved. 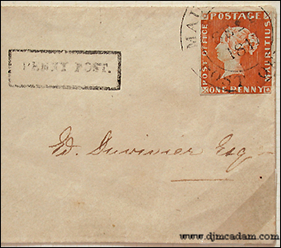 Philatelic covers are different, which is probably why relatively few nice 19th century examples have come down to us. They're big. They come in all sorts of sizes. They bend easily, crease easily, often tear easily. In short, many people avoided (and perhaps still avoid) collecting covers because covers are hard to store. Nevertheless, I like collecting covers, so I decided I'd just have to face the problem and deal with it as best I could. The plastic sleeves with covers in them should be appropriately stored. If you are about to ask me at this point whether plastic sleeves (or polysleeves, or whatever marketers of philatelic supplies want to call them) are safe for valuable covers, do not; I simply don't know the answer. Thus, if you choose to store your covers in plastic sleeves, you do so at your own risk. I store mine that way, and that's all I can honestly tell you. I would like to point out here that if you're ever put in the position of shipping a philatelic cover to someone else, it would be nice of you to ship said cover in a properly fitting polyester sleeve placed in a bend-proof container. Often, if I purchase a cover on eBay, it comes to me either simply tossed unprotected in a plain envelope, or wrapped in a bit of Saran Wrap, or some such nonsense. Since I cannot say whether polyester cover sleeves are truly safe, it follows that I am unable to make any personal recommendations as to brand or seller. I would like to point out that there are also cover albums (usually called First Day Cover or FDC albums), which sort of combine the sleeves with an album. Collecting philatelic covers is a great way to expand your collecting interests, and many covers are so attractive that you may consider framing them. Once displayed, such items will undoubtedly be of interest to guests who visit.